This top model is a pure and low cut speed skate. The boots are made to skate fast and tough races on the track as on the streets. The layout “Race” distinguishes itself by a minor cushioning which makes the boot even narrower and stiffly attached to the foot. Skaters with more sensitive feet can chose the layout “Comfort” which is made with extra cushions to better support the feet in a tight speed skate. The shell is completely made of carbon which makes the shell extremely light and stiff. The carbon shell encloses the front toe section to precisely transfer the skating forces from the feet to the skates. It is possible to integrate a cushioned bottom at customer’s option. The boot tongue is made with a neoprene layer and cushioned to avoid unnecessary pressure from the lacing and closing system onto the upper feet region. 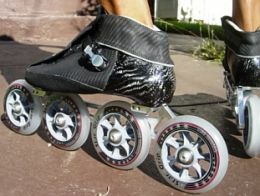 Furthermore the shoe tongue is secured with hook and loop fastener to avoid shifting while skating. The top model includes our “Vario Canting System” and guarantees a perfect setup of the frame to the boot, particularly for those skaters with possible wrong feet positioning (e.g. to cant on the inside or outside). The required cotters and screws are included in the total price. The inner and bottom layer of the boots are made of authentic calf leather to prevent odor formation compared to synthetic materials. It is possible to build the boots very tight to the feet to be able to wear the boots without skating socks. Thereby the formation of sweat while wearing the boots binds the wet leather even tighter to the naked feet and the racing experience is once more optimized. By choosing the model Junker “Peregrinus” – Race and Comfort – and extra charge our customers are able to configure their personal Junker Skate in a more unique appearance. For example, it is possible to choose a silver layer as the face sheet of the outer carbon shell. In addition, our customers can choose between a stitched Junker logo and a rubber label. We provide our customers with different color configurations of which our customers can create their own personal Junker Skates. Please note our color configuration and pick out your favorite colors in advance! By en extra charge the buckle position can be selected like our “Top Closing System”. For all our models our customers can choose between long mount (195 mm) or standard mount (165 mm). We are also capable to take eventually differences of the leg length into consideration when we build the new Junker Skates. Therefore we are pleased to help and advise our customers anytime! Conclusion: Junker “Peregrinus” is a true race boot specially qualified for speed skaters who don’t want to make any compromise when choosing Custom Made Boots! Please note: a summary of the technical features and prices of our models are located under “models and pricing”. Each customer is personally advised and professionally counseled by us so we can build the best possible Junker Skates just for you! This model was named like the fastest animal in the air: Falco peregrinus, the peregrine falcon. This animal is the biggest bird of prey in Germany. He has a compact and short body shape with an acuminate caudal and wing end. This shape gives the bird a perfect water drop form whereby the bird can reach high speeds of about 300 km/h for a few seconds to catch the prey in the air.